When the White House becomes concerned about the safety of the President of the U.S., Intelligence Officer Amanda Waller (Viola Davis) has a plan. She wants to get a team of super villains together and have them fight against possible threats to the country. In exchange, the villains are promised reduced prison sentences. 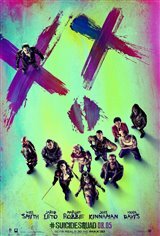 The group includes master assassin Deadshot (Will Smith), Harley Quinn (Margot Robbie), The Joker (Jared Leto), Killer Croc (Adewale Akinnuoye-Agbaje), Captain Boomerang (Jai Courtney), Enchantress (Cara Delevingne), Katana (Karen Fukuhara), El Diablo (Jay Hernandez) and Slipknot (Adam Beach). Rick Flag (Joel Kinnaman) is put in charge, and he soon finds out that the villains are a handful.